Free Shipping Included! 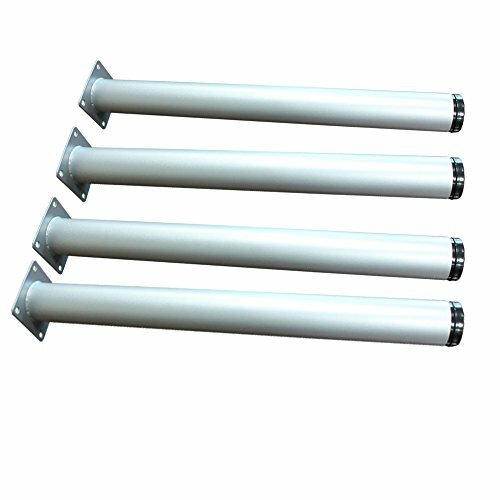 Greenjet 20inch Round Metal Table Legs, Office Desk,Coffee Table Leg, Home Furniture, Kitchen, Hardware Set of 4 Silver Save 20% by Greenjet at N Online Agency. Hurry! Limited time offer. Offer valid only while supplies last. SAVE 20% NOW!! Stop wasting time looking for a bulky, ready-assembled table, why don't create your own table with Greenjet 20'' round table legs. Stop wasting time looking for a bulky, ready-assembled table, why don't create your own table with Greenjet 20" round table legs. Each set comes in 4 pieces of table legs and screws. It is easy and effortless to attach these legs to the top by using a screwdriver. Constructed of sturdy tubular steel with silver coating,Greenjet table legs feature great support and lasting performance. With sleek shape and beautiful smooth finish, our round table legs fit well in small cramped places or rooms decorated in modern style. Adjustable leveler foot ensures your table to stably stand on the uneven ground. There's additional 1" upward design for customers to tailor the table height to their needs. Product dimension: 1) Overall length: 20" 2) Tube: 1-31/32" dia. Suitable Height - The table legs measure 20" in length. They're perfect as base of coffee table or living room table. Easy Installation - Each set includes 4 pieces of table legs and screws. A screwdriver is good enough for the assembly. Great support - Made of sturdy tubular steel with silver coating, the table legs provide enough stability. Leveler feet allow additional 1" upward height adjustment for uneven floors. Sleek and Decent Design - This silver table legs not only upgrade the look of the table, but also add contemporary flair to any room you put them in. Best DIY Option - Stop wasting time looking for a bulky, ready-assembled table, why don't create your own table with our round table legs. Coming in glossy silver finish, the set of table legs will work well with your table board. If you have any questions about this product by Greenjet, contact us by completing and submitting the form below. If you are looking for a specif part number, please include it with your message.